A new café themed on 3D and 2D geometric shapes has just opened up in your neighborhood, and the chef is getting ready for its grand opening. The menu is looking very appetizing, and you and the rest of the mathlings are getting ready to taste the best of family favorites! Alas, there is trouble brewing in the kitchen. The chef’s assistant is nowhere to be found, and time is running out! Luckily for him, you have great cooking skills and are ready to save this very grand opening! To help the chef serve delicious orders to the very hungry customers waiting in line, you have to sort every food item out by 3D and 2D geometric shapes as well as shape descriptions. There are many food options available on the menu, from healthy bento boxes, to pyramidal watermelons, to perfectly wrapped sandwiches in cute checkered takeout boxes. With every customer order, comes a short description of what the customer wants. By using the description, choose the correct order among three different food options. 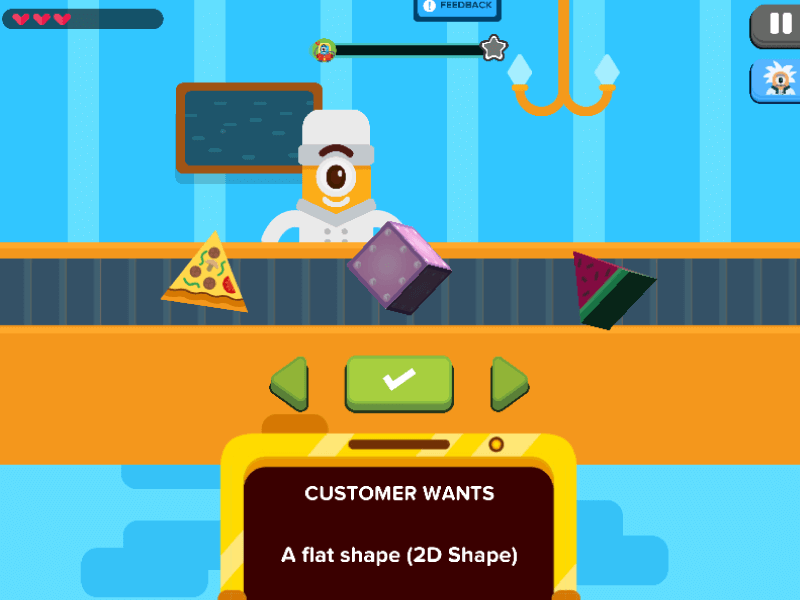 For instance, if a customer describes his order to be a 2D geometric shape with 3 sides, a pizza comes into mind. It is up to you to study the order and deliver it right. You can submit your answer by tapping on the green button. If you get the order correct, the chef goes ahead and wraps it up for delivery to the satisfied customer! If you get the order wrong, the chef gets upset, but is always very supportive in you giving it another go! In Shape Picker, you will be practicing how to identify a menu of shapes ranging between 3D and 2D geometric shapes. Shapes are an integral part of the learning process, and this game encourages players to expand their knowledge of shapes into dimensions and property measurements. As you study each order description to determine which food item to serve, you will build a stronger understanding of shapes and their many unique attributes. This is vital for learning more complex geometry concepts in the near future. Because many shapes have such unique aspects to them, having a keen attention to detail contributes to better results. Shape Picker brings concentration and a practiced familiarity of shapes to play, increasing your confidence in establishing a myriad of shapes and their properties in the form of recurring practice. The careful evaluation and proper analysis is promoted throughout the game. This establishes a boost in math confidence as well as a steady progression in geometric shape recognition. This game is shaping up to be a party of 2d shapes!